Tax deductible donations have always been a reliable method for people to reduce their taxes. However, if you're like most people, you probably have a few lingering questions about how tax deductible donations work. 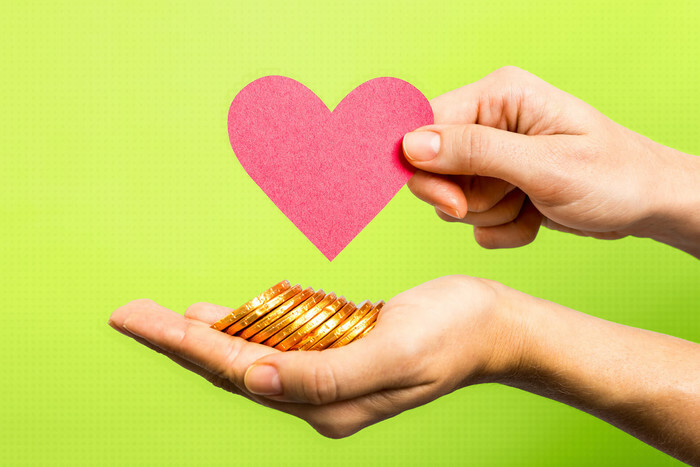 To help you out, we've compiled this primer on charitable contributions. How Do Tax Deductible Donations Reduce Taxes? The IRS allows individuals to save money on their taxes if they make donations to charitable organizations. These donations can be monetary or they can be in the form of goods like clothing, cars, property, etc. Jane's a single woman earning $100,000 a year. 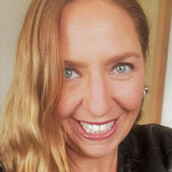 She donated $15,000 to charitable organizations in 2018. Jane's standard deduction is $12,000. However, by itemizing deductions using her Schedule A tax form, she can subtract her charitable donations from her taxable income. In this scenario, that would lower her taxable income by $15,000—meaning she'd only pay taxes on $85,000, rather than on the $100,000 she actually earned. 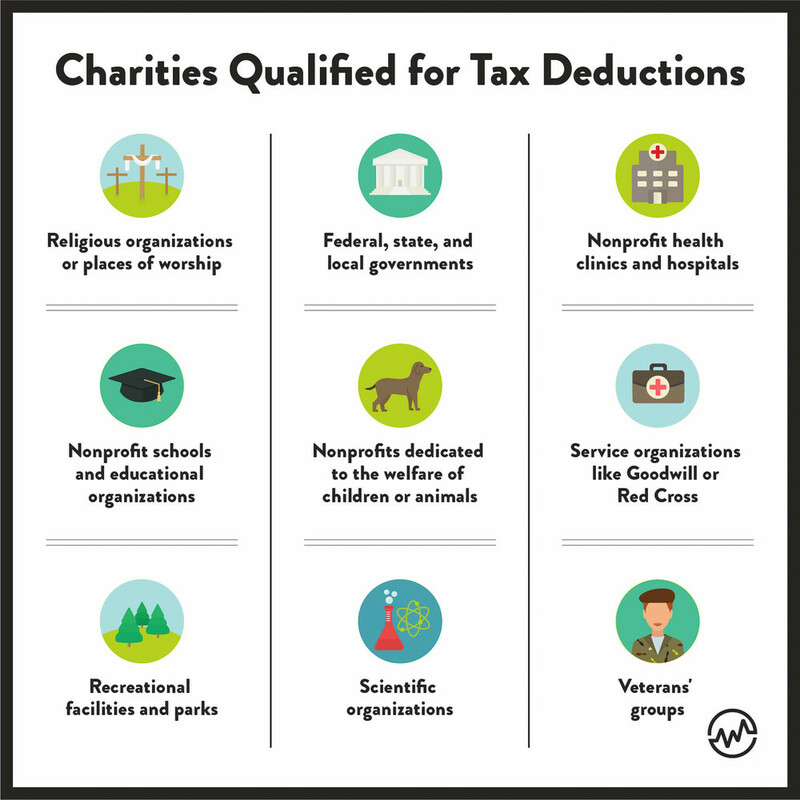 Which Charities Qualify for Tax Deductions? 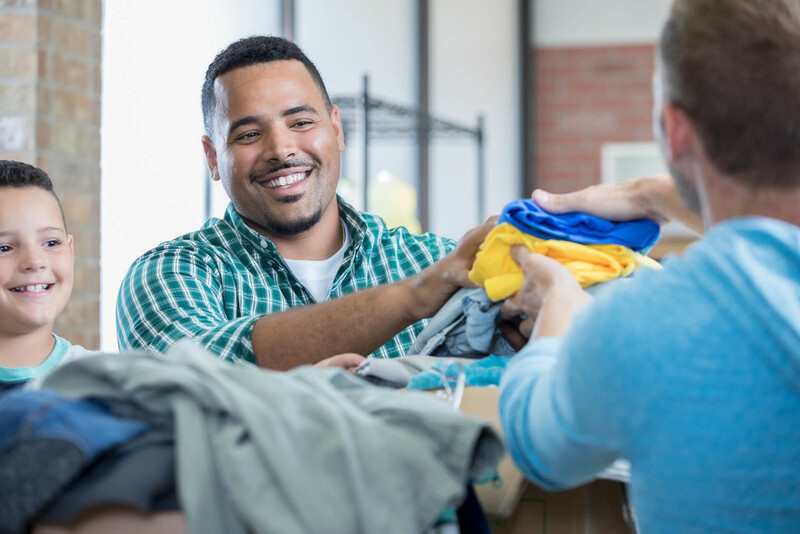 To find out whether a charitable organization is IRS-approved or not, you can visit the IRS website and download a list of qualified charitable organizations. Has There Been a Recent Change to the Tax Law Affecting Tax Deductible Donations? There has indeed. The Tax Cuts and Jobs Act of 2017 raised the standard deduction for filers significantly. 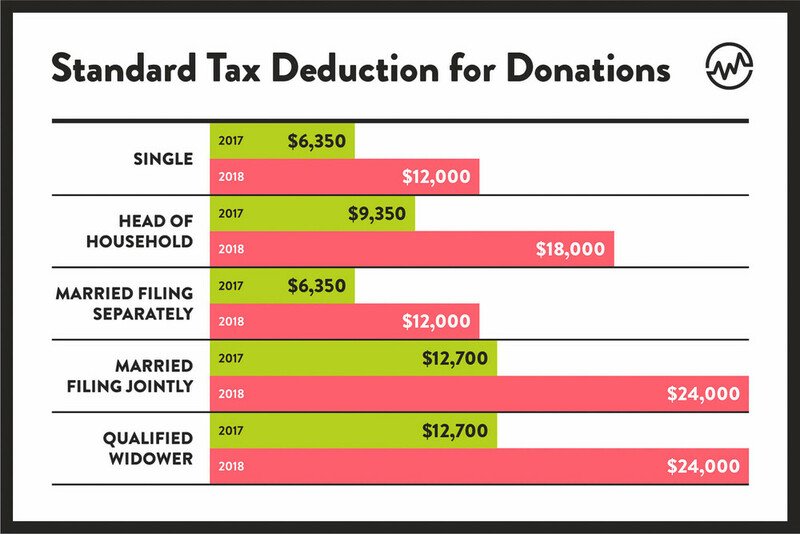 Because the standard deduction has just about doubled, taxpayers need to donate a lot more money to charity to make itemizing on their taxes worth the effort. Let's say John is the head of his household. He earns $100,000 a year and he donates $15,000 of his income to charity. In 2017, John would itemize because $15,000 is greater than his standard deduction of $9,350. But with a standard deduction of $18,000 in 2018, itemizing won’t do him any good. The deduction is now higher than his contribution. This is why the Tax Cuts and Jobs Act of 2017 will cut the number of people who itemize by nearly two-thirds. According to the IRS, 30% of taxpayers itemized before the law passed. Now that the law's been enacted, the Tax Policy Center estimates that itemizing taxpayers may drop to as low as 10%. How Can I Maximize My Tax Deductible Donations? There are still ways to get around the higher standard deduction in the wake of The Tax Cuts and Jobs Act of 2017. To maximize your tax deductible donations, there are a few different strategies you can use. These strategies include bundling, donor-advised funds, and qualified charitable distributions. With bundling, you double your donation to charities one year, then don’t include your donation the next year. Let's look at how this works with an example. Steve and Angie are a married couple who file jointly and typically contribute $20,000 a year to qualified charitable organizations. In 2018, they'd choose to take the standard deduction of $24,000 because that's higher than their itemized deduction of $20,000. Going forward, they have two options. Their first option is to continue to take the standard deduction each year of $24,000, ultimately giving them a deduction of $48,000 over two years. Their second option is to bundle their donations—essentially making two years' worth of donations in just one year. In 2018, they'd donate double to the charitable organizations they support, contributing $40,000. They'd itemize that deduction, reducing their taxable income by that amount. Then, in 2019, they'd donate nothing to charity, taking the standard deduction of $24,000. By following this strategy, Steve and Angie could donate the same amount of money to charity over a two-year period and receive a deduction of $64,000. Compare that to the first option where they'd only experience a $48,000 deduction by taking the standard deduction. Which would you choose? A donor-advised fund (DAF) is a fund that allows you to grant money to multiple charities over time. You can open a DAF with an initial contribution (cash, stocks, mutual fund shares, real estate). This contribution is then invested for you, allowing it to grow tax-free. When you're ready to donate to a qualified charity, you can then specify to your DAF sponsor that you'd like to make a grant request. The benefit of a DAF is that the value of your contribution is tax deductible in the year you open it. So, if you opened a DAF in 2018 with a contribution of $30,000, you could deduct that amount from your taxable income in 2018 by itemizing—even if you decide not to grant the money to any charities until 2019. A DAF can be opened with as little as $5,000. 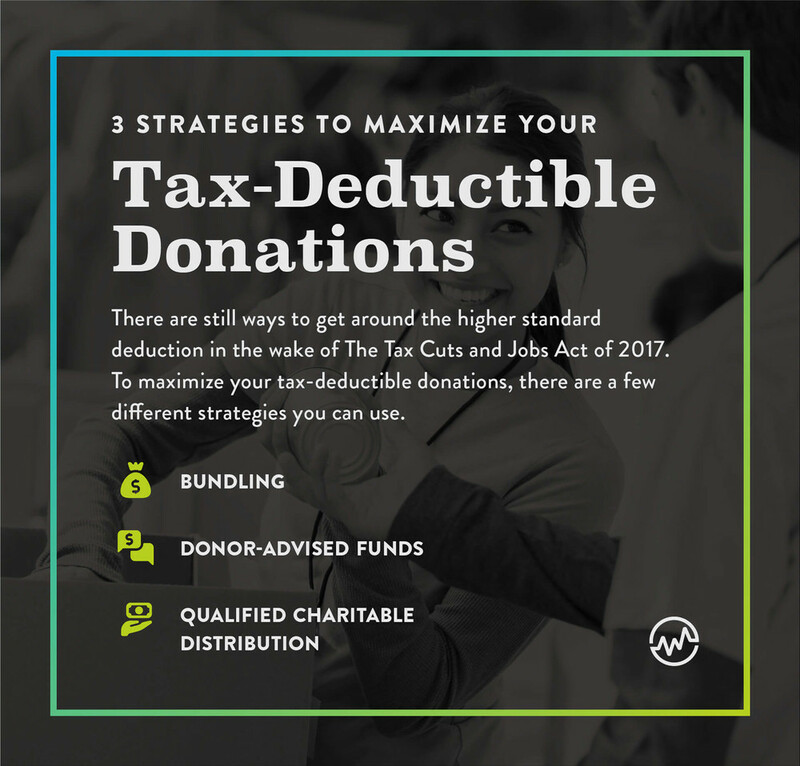 This strategy is a great way for you to maximize your charitable deductions in the wake of the Tax Cuts and Jobs Act of 2017. If you're at least 70½ years of age and have an IRA, congratulations. You have yet another option for maximizing your deductions. The tax code allows you to donate up to $100,000 a year to a public charity directly from your IRA. This is called a qualified charitable distribution, or QCD. This distribution doesn't count toward your taxable income. However, the money must be distributed directly from the IRA to the charity—you can't receive it from the IRA and then turn around and write a check to your chosen charity. As a result of the higher standard deduction in 2018, charities are projected to lose between $16.3 billion and $17.2 billion this year. That means charities need your financial support now more than ever. If charitable giving is important to you, don't stop donating—donate smarter. Speak with your accountant about these strategies. Then determine the best way for you to give back now and get back during tax season.